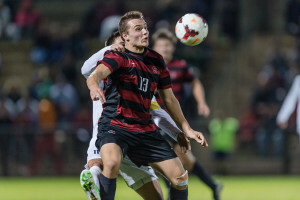 Stanford sophomore Jordan Morris scored the only goal for the U.S. U-23 men’s national team in the team’s opening game of the 2015 Toulon Tournament against host team France. The goal comes only about a month after Morris’ goal in the U.S.’ 2-0 win over Mexico and continues his sensational start to his career with the USMNT. It came in the 65th minute, when Morris took a pass from Liverpool’s Marc Pelosi and beat two French defenders before he completed the play with a subtle touch into the lower right corner of the goal. Sadly, the goal came after 3 unanswered goals by France, and the U.S. had to settle for a 3-1 loss. The U.S. will next face the Netherlands on May 29. Qatar and Costa Rica round out the five-team group, with the winning teams in each group meeting in the final on June 7. Contact Sandip Srinivas as sandips ‘at’ stanford.edu.